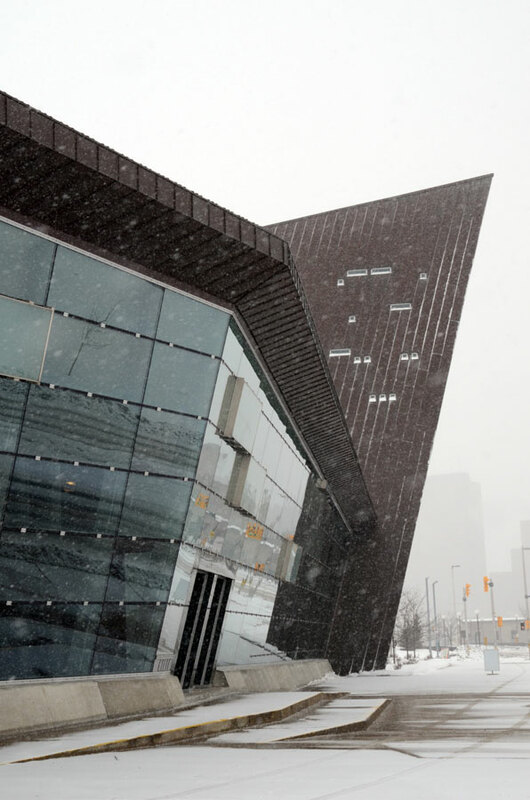 The Canadian War Museum in Ottawa is sustainably designed with the notion of regeneration. At the back it rises gently out of the landscape in some places barely visible. In the summer its green roof sways with approx 10,684 square metres of native grasses further integrating the building into the surroundings. 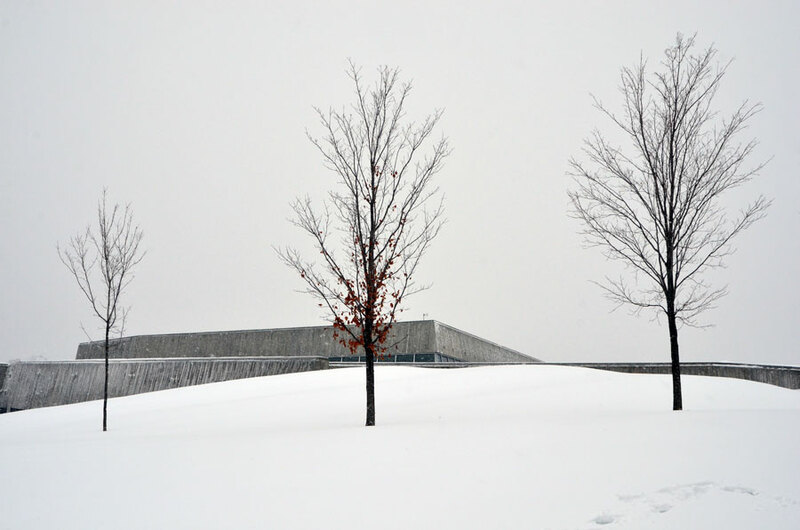 In the winter I love how minimalist it appears from different angles, how the materials used and the cement in particular, soften against the snow. Every angle intriguing. It’s a very thoughtful building. The back really does look very bunker like and that large “shard” looks like a ship from some angles. I love how it reads so many different ways. 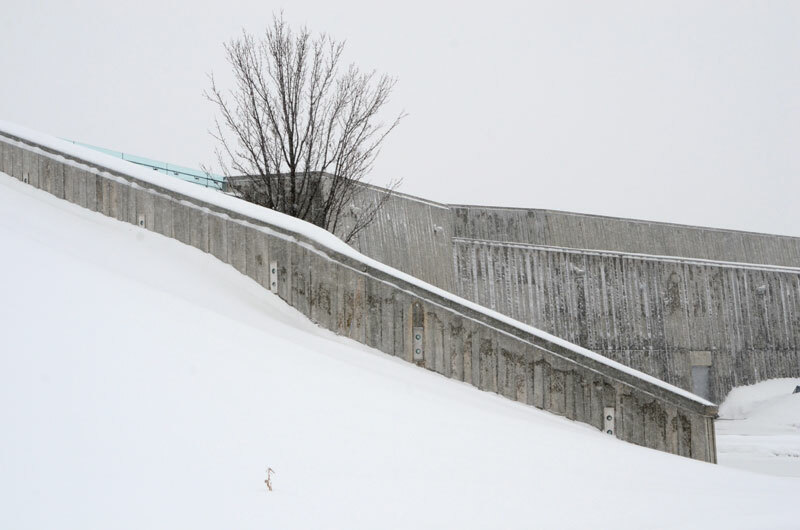 All amazing photos… almost seem magical, the snow is fantastic and the shapes of the buildings look great. Thank you very much Filipe. The snow really sets off the architecture. I really like stark buildings, being a child of the sixties. The use of natural materials is impressive and would love to see the seasonal changes taking place. Me too, I love stark buildings, and this one in the snow really does highlight the architecture. 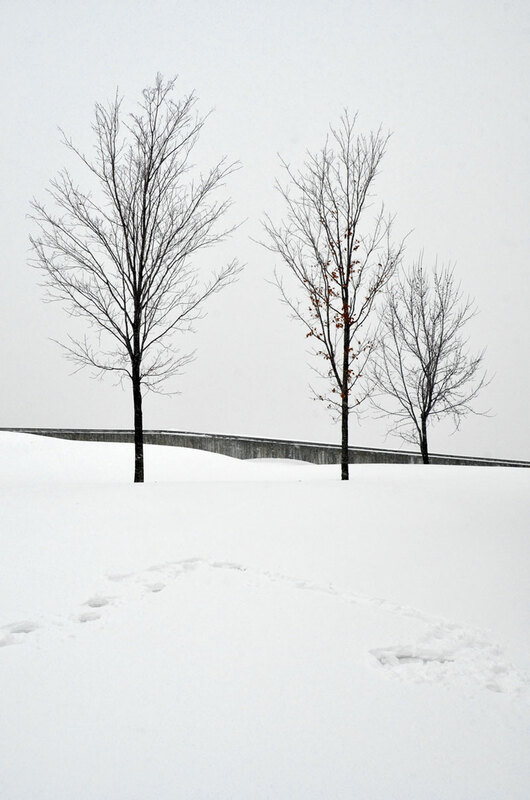 The ‘minimalist’ photos, contrasting the young trees with built structures, are particularly effective. Yes, those little tress became an important part of the composition in some cases. Thank you. Reminds me of an early Cronenberg movie. I like minimal buildings too and this one is just so interesting. Thanks Inga. This reminds me of the Imperial War Museum Manchester, with its offset angles and disturbed lines. As schietree said, a hunkered down bunker. Great photos, the snow makes such a difference to pictures as well. I will check out that museum on line. Thanks Jim. Oh I’m not an architect! But I love architecture, and do architectural photography. The museum in the link you sent is gorgeous. 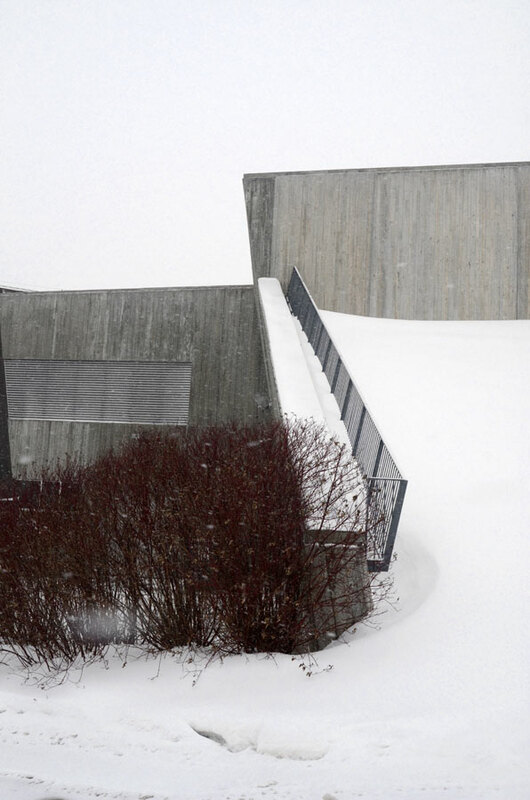 Museum architecture is often very outstanding, as is Norwegian design! Really interesting structure. It provokes mixed feelings for me. 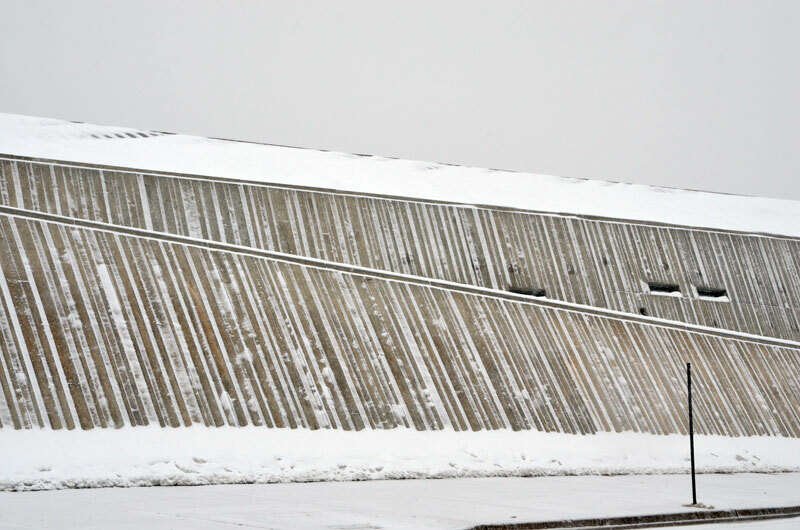 The snow and the concrete walls seem quite ominous, especially with the industrial roller door, but I really like how the street frontage leans out toward you. Will you take some more later in the year when there’s grass maybe? I will take more in the summer, it definitely changes with the seasons. very interesting shots Karen. . I particularly like the juxtaposition between tree and building.. Thank you Helen, it was nice to have some little trees around, I think the landscaping is very thoughtful. This is beautiful, Karen. I love this post. Thank you, it’s a beautiful building isn’t it? So beautiful that I have to re-blog it. love these images! so linear and so well composed! very cool post – loving the urban edge Karen! I was raised near there, but it is obviously more recent. I’ll have to check it out on a trip back home. Great shots. I remember you said you were raised in the Renfrew area, not far at all..
Bike past it all the time in the summer – great winter shots – such a different perspective. Hi Anita, it is different in the summer for sure, thank you for your comment. Amazing construction. Great pics too! It is great construction, thank you Sil. 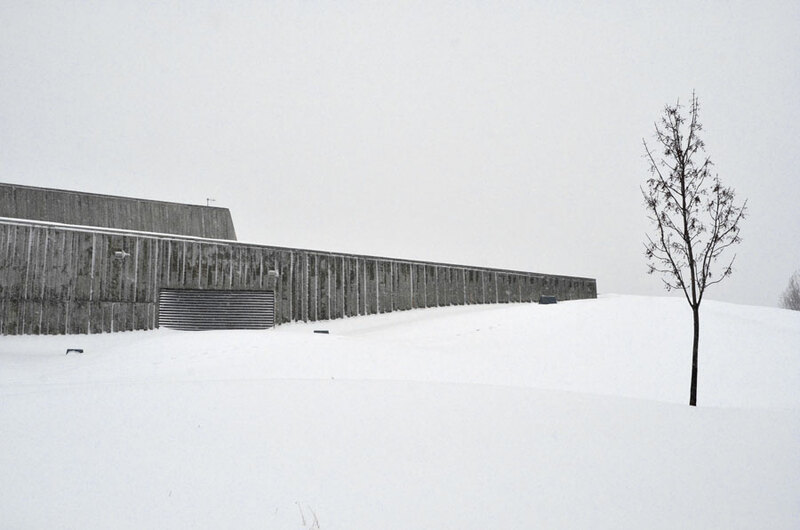 What a fantastic building – it sits so well in the snow. I think Canadians must have a more acute sensitivity to how a building looks in its surroundings – and what it says about its purpose. Not designing a building on paper and then just plunking it down somewhere. I visited the Canadian Museum of Civilization a few years ago and thought the building itself was a statement. Lois it’s so interesting to watch how buildings change through the seasons. These are great architectural/environmental photos. 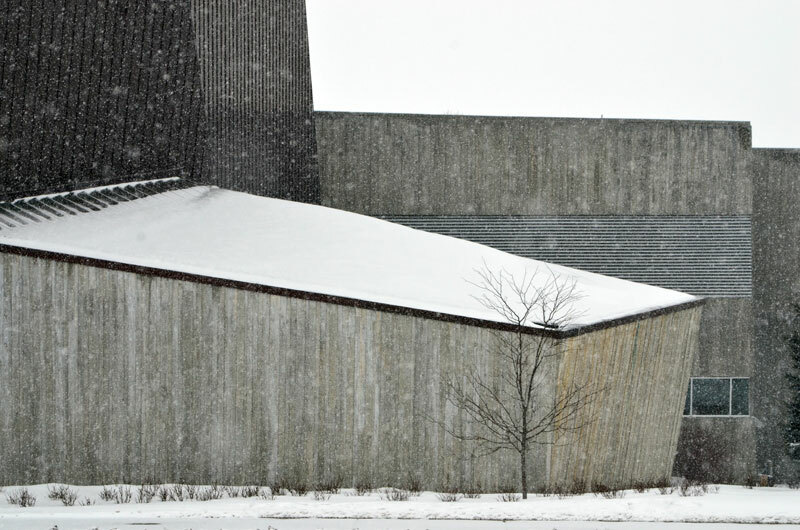 The snow really helps simplify and exaggerate the form and lines of the building. Thank you Steve, I was drawn to the simplicity also. love this building and the quote at the end. you’ve captured the textures amazingly! The textures are highlighted against the snow. I also like how they collect some of the snow. It’s a great building! This is another favorite post of mine. Gee, keep shooting. Snow and you are a good combination. Have you submitted your work to museums and galleries? Carla, thank you. Your words are always encouraging and thoughtful. Great geometry. I love “things” in snow pictures. Thank you, me too – It minimizes some of the distractions.